We just received the news that CCS was unsuccessful in both the Bar Council of Ireland AND Law Society lotteries. We can't win them all! 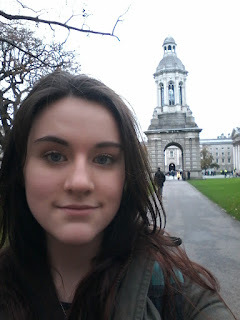 I recently participated in TYPE or the Transition Year Physics Experience in TCD. This is a week where a select number of TY students from all over Ireland get a chance to experience what it is like to study Physics in Trinity. As part of TYPE I took part in several experiments such as clouding levitation and the collision of two hydrogen particles. These were both very new and interesting experiences. I also took part in a day trip to Dunsink Observatory where I got to learn about Astrophysics and watch solar flares using a telescope. This was definitely a worthwhile week and I would recommend that anyone thinking of doing Physics for the Leaving Cert. should apply for this programme. TYS will be involved in a balloon release on Mon 28th Nov at 12.40 on the Gaelic pitch. The purpose of this symbolic gesture by Lifeline is to highlight the plight of victims of domestic abuse in Ireland. Please go to class for roll call and your teachers will accompany you to the pitch afterwards. The Department of Foreign Affairs and Trade Competition for TYS - Iveagh Scholars - is now open for applications. Iveagh Scholars is a competition in which TYS from the Republic and Year 12 pupils from Northern Ireland are invited to consider and share their views on Ireland's role in the world. The prize for the 30 most considered, creative and though-provoking responses will be a unique opportunity to experience at first-hand the work of the Departmemt of Foreign Affairs and Trade at their headquarters in Iveagh House, Dublin. Last year's successful entrants participated in a wide range of activities, including running a mock press conference, handling a fictitious consular crisis, taking part in UN negotiation simulation and visiting a foreign embassy in Dublin. Please click on the link below to see a short film clip that will give a flavour of the activities. Our own Oisin Bowyer features. Theme 1 - Write a persuasive pitch for Ireland's campaign for election to the UN Security Council in 2020. Theme 2 - Students are asked to think about Our People and Ireland's relationship with its diaspora - the millions of people around the world who are Irish by birth, descent or affiliation. Further details can be found on the TY Noticeboard on the mall. Alternatively, if pupils provide me with a parental email address, I can forward the information. CCS is allowed to submit one name to go forward for a national lottery, so there are no guarantees! Pupils would have to have somewhere to stay in Dublin but there is some funding available towards accommodation. Tomorrow, Tue 22nd Nov, TYS gather as a cohort for the first time since the TY Induction morning in the Aras. Our first SHARE was supposed to be our bonding session but alas that had to be postponed. Let's support this worthy cause and have a bit of craic at the same time! Tomorrow, TYS can sit at whatever table they want, with whatever friends they choose. Your contribution will make a difference to chronically ill children and their families as they endure a terrible time of worry and uncertainty. We would like to thank Class 3G and Ms Crawford for giving us the honour of being their guests. 3G are working off the premise that you are all well-reared young people and know how to behave in a restaurant! Enough said! Each year, St. Patrick’s Walk In My Shoes Transition Year Programme invites 100 students from all over Ireland to take part in a week long placement, hosted by the Adolescent Mental Health team at St. Patrick’s University Hospital. The aim of the course is to educate young people about mental health and career opportunities within the mental health sector directly from clinicians at the campus of St Patrick’s University Hospital. All participants will return to their schools as ambassadors for mental wellbeing and share their new understanding of positive mental health by preparing and giving a presentation to their classmates.The project was set up in 2012 to breakdown the stigma of accessing mental health services amongst young people, and has grown over the years to become a comprehensive and worthwhile education course. To date we have welcomed almost 500 students on to the programme from all over the country. All TY students are eligible to take part in the programme however due to high demand, places are limited and we can only accept one student per school. Interested parties should give their name to Ms.McGeehin to be entered in a school draw. The programme has something to offer all students regardless of subject or career interests; however it is a particularly valuable programme for students interested in a career in the health sector, including medicine, nursing, psychology, pharmacy, occupational therapy and social work. Interest in the programme has increased year on year, and feedback has shown that the experience is a positive and lasting one for students. Past students have made positive connections with follow students and staff which have continued long after programme completion. A recent survey of students found that almost all respondents (96%) believed that their experience had been of benefit to them in preparing for a future job or role in the workplace. I was one of the lucky 25 people from around the country to be offered the opportunity to do their work experience in Trinity in the Biochemistry and Immunology Department. On the first day, none of us had a clue about what we would be doing but throughout the week we learned a lot about immunology and how cells react to protect themselves from disease. We were assigned labs to work in and at the end of the week we even got to see where all the animals were kept, but we had to wear a lot of protective clothing. It was really interesting to work in a lab because the people we were working with were finding cures for MS and Whooping Cough. I also learned a lot about what it's like to be a Ph.D. Student in science. It was a great experience that really helped me to decide what kind of career path I want to take in the future. Donegal Sports Partnership are seeking 12/15 TYS from CCS to assist at the Regional Sports Hall Athletics events for primary schools on Wed 7th December. Volunteers should make themselves known by putting their name on the TY Notice Board in the Mall. Any TY interested in applying for a position in the Bank of Ireland School Bank should go to Ms McGoldrick in R.122 for an application form a.s.a.p. The interviews will be held early next week. This is a wonderful opportunity to learn. I'm banking on you not to miss it! All mini-company business must be according to TY rules. 1. Your Enterprise teacher (past or present) must email in advance the teacher whose class you will be missing. 2. The student must go to their subject teacher and request permission to miss that particular class.